IT technicians nowadays have the option to provide offsite support to their clients’ technical issues. The days of driving to their clients’ locations just so they can resolve their technical problems are gone. This enhances their productivity and makes their work a lot more efficient. In this guide, we’ll show you what remote support software is and why you need to invest in one. What is a Remote Support Software? 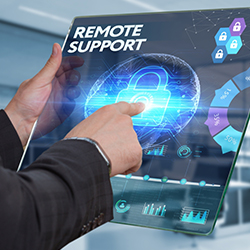 Remote support software is a tool that allows IT help pros to access their client’s computing machines to provide remote support or assistance. This enables IT technicians to log in to the device regardless of its geographical setting. Once connected, they can perform a bunch of tasks on the remote computer as if they are sitting in front of it. They can install apps, manage updates, and as stated earlier, provide onsite support. It is also important to not confuse remote support software with remote desktop software. The two may provide access to a remote computer via the internet, but they differ in terms of their functionalities and services. A remote desktop software allows users to access a remote computer from anywhere with the help of an internet connection. This enables them to access files without needing to be physically present in front of the remote device. On the other hand, a remote support software enables users to provide support to a wide range of devices remotely. This can include regular monitoring and maintenance of the devices to advanced overhaul and repair. What are the Benefits of a Remote Support Software? Saves time – IT technicians don’t need to go from one location to another just so they can provide onsite support. This saves them an awful lot of time, which in return, gets their job done a lot faster. Reduces costs – IT help pros can save on travel related expenses as they don’t need to be at their clients’ locations. Also, businesses can centralized their IT departments in one location to avoid extra spendings on a number of IT offices in different work locations. Drives up productivity – A remote support software also ensures that IT help pros stay productive no matter what the situation is. Since they can finish their tasks remotely, business functions are still maintained and pushed through. Secure Remote Access Technology – ITarian Remote Access offers strong video encryption by default via Secure RTP Protocol. This means that all confidential interaction made between you and your clients are kept private. It also ensures that no important data or information is leaked or exposed. Session Confirmation – ITarian Remote Access ensures that all access made on both the local devices and the endpoint computers is authorized. This requires any remote user to provide the right log in credentials to make sure that the connection is safe and secure. Multi-Screen – If your target endpoint uses multiple screens at the same time, ITarian Remote Access has a solution for that. It provides a multi-screen option so you can view and access all of them simultaneously. Customization Tools – ITarian Remote Access allows you to adjust the display size of the remote endpoint screen. You can also alter its resolution based on your own computer’s default resolution. This enables you to have the best visual experience. Here are some of the customization tools ITarian Remote Access provides (as cited in ITarian’s website. Scaled – "Displays the target desktop with the resolution of the admin computer." Original – "Displays the target desktop at its own resolution." Full screen – "Displays the remote desktop in full-screen view." Firewall Free – ITarian Remote Access uses standard technologies and protocols so you can connect to any endpoint devices without configuring your firewall settings. You also don’t need additional hardware configuration using this software. Investing in an effective remote support software doesn’t need to come at the expense of your financial capabilities. With that said, try to consider adding ITarian Remote Access to your own work assets. After all, this remote support software is for free, and is both secure and easy to use. If you want to get ITarian Remote Access for free, click here now! Does Free remote support information is useful?